The recent breakthroughs in the infrastructure and transportation network in the northern city of Hải Phòng have turned the city into a major industrial and logistics c in the north. In recent years, the port city has made major infrastructure developments involving intermodal transport (seaway, airway, road, waterway, and railway) that have been game-changers in attracting foreign direct investment and spurring economic growth in both Hải Phòng and the northern region. The road network has recently been extended with the addition of a new expressway connecting the Hà Nội – Hải Phòng Expressway and National Highway No 18 in Hạ Long’s Đại Yên Ward. The Hải Phòng – Hạ Long Expressway, which has been opened for traffic since September 2, 2018, has a total length of 24.6 kilometres, including the Bạch Đằng Bridge of 3.5km spanning the river at Hải Phòng’s endpoint. The total distance from Hà Nội to Hạ Long has been reduced to 130 kilometres and travelling time has been cut by 30 minutes to 1.5 hours. Later this year, the Hạ Long – Vân Đồn Expressway is expected to open to traffic, and the Vân Đồn – Móng Cái Expressway leading to the Chinese border is expected to be completed by 2020. These expressways form an essential transportation network among the three northern economic powerhouses – Hà Nội, Hải Phòng and Quảng Ninh. Furthermore, this also brings businesses closer to trading activities with the vast south-west China market. 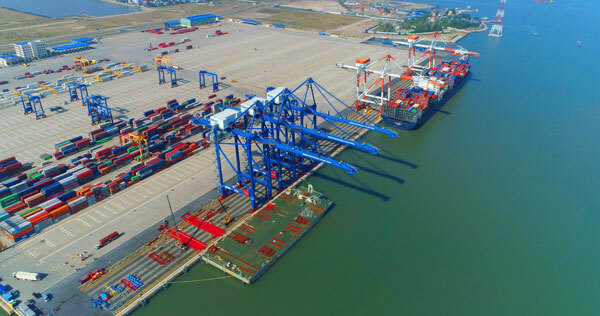 The Lạch Huyện deep sea port – Hải Phòng International Container Terminal (HITC) has acted as a game-changer in improving the city’s logistics competitiveness. With a draft of -14m, the port had major impact on the logistics landscape of northern Việt Nam, with the ability to accept vessels of up to 100,000DWT. Direct shipments from Hai Phong to the EU, US and Canada are now available, reducing shipping time to international destinations by 5-8 days thanks to the elimination of transhipment time at regional ports. Cargo can now reach Europe in 23-25 days, the US west coast in 27-30 days, and the US east coast in 13-15 days. As such, businesses will be able to save significantly on logistics costs. On April 10, HITC welcomed the first direct Trans-Pacific service to the US and Canada, and will continue with other direct services from India, the Mediterranean and the EU in the future. Shortly, In terms of air transport, Cát Bi International Airport is an international air gateway that plays a key role in the socio-economic development strategy of Hải Phòng and the country’s northern coastal region. Since it opened in May 2016, the airport has been growing at a rate of over 25 per cent per year in passenger throughput. The airport is planning to double its capacity, aiming to accommodate 8-8.5 million passengers per year by 2025. Another major driver that makes Hai Phong stand out is its proximity to China. With the dispute between US and China, several companies are re-considering their China +1 strategy. Haiphong is perfectly located to play a key role. Not only will it allow for a fast and smooth movement of goods manufactured in the region, it is also the closest port for the south west of China. As such, Hải Phòng has become the focal point of infrastructure development and the trading centre of northern Việt Nam with China, South East Asia and global markets. Hải Phòng has been rapidly developing in the past few years. . Statistics show that the city so far has attracted 641 FDI projects with total registered capital of US$17.16 billion, according to local authorities. Foreign-invested projects in the city mostly operate in manufacturing and processing, logistics, and the petrochemical industries. FDI inflow to the northern port city last year reached more than $2.62 billion, surpassing 75 per cent of the set target. Hải Phòng is the fastest-growing city in Việt Nam, with a GDP growth rate exceeding 17 per cent. The city has the necessary infrastructure, reliable utilities, labour supply, and a strategic location for investors to make the best of new opportunities from various free trade agreements. The Deep C Industrial Zone (DEEP C), which is at the centre of a multimodal logistics network in Hải Phòng, has significantly contributed to the city’s development and helped attract major foreign investors. The cluster, occupying a total land area of over 3,000ha, has become one of the premier IZs in the north of Việt Nam, attracting 100-plus projects backed by multinational companies from Japan, Germany, the US, Việt Nam, Singapore and South Korea, with a total investment amount of over $3 billion. Prominent investors in Deep C include Bridgestone, JX Nippon Oil & Energy, Idemitsu, Shin-etsu, Chevron, PV Oil, IHI, Nippon Express, Yusen, Knauf, C. Steinweg and Flat Group. Besides reliable utilities provision and a unique location closest to the biggest port of the north, DEEP C has also differentiated itself by further investment in the green and eco-friendly development of Việt Nam, including eco-industrial zone, inland waterway ports and renewable energy. Hải Phòng Investment Seminar will be organized on April 18-19 in HCM City. During the event JLL will present its whitepaper: “Haiphong: a vision for growth” while HICT will explain about what the the new deep water port will bring for investors. These experts that have boots on the ground are going to o share insights and updated information about infrastructure developments, investment opportunities and business potential of the city. Businesses that want to take advantage of the developments and seek investment opportunities are free to participate in the seminar. For more information and registration, please contact the organizer at email registration@deepc.vn and the website www.deepc.vn.